It’s snowing like crazy this afternoon, April 11th. So that clearly means it’s time to write about …more hats. If this snow keeps up and foils our plan to not shovel again this season, since we assume that because it’s mid-April it will melt quickly, maybe we’ll still be wearing hats in May. This is Rafa’s Hat, a freebie by Argentinian designer, Joji Locatelli. And, yes, if you’ve clicked on that link, maybe your man will end up looking like Locatelli’s model if you knit him this hat. Probably not, though. She sees it as a “manly” hat and it is. But it’s a perfectly proper womanly hat too. 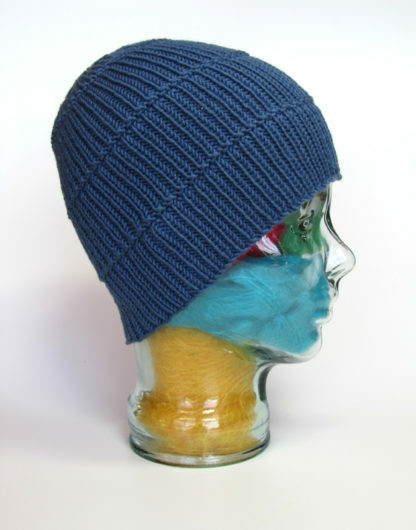 I knit mine in Plymouth Yarn Worsted Merino Superwash, one of my favorite worsted weight hat yarns. This knit looks best knit in a yarn with excellent stitch definition. Here’s the well-behaved, attractive crown decrease section. 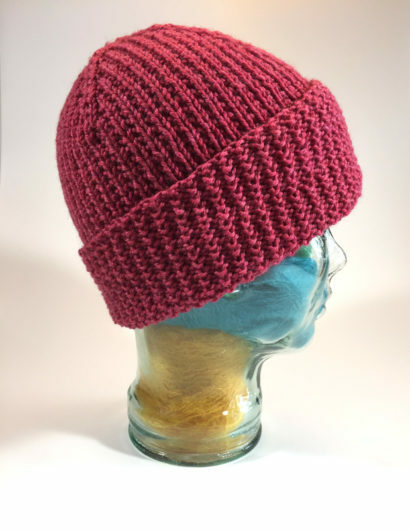 I decided to work fewer rounds (only four) after the last pattern repeat that ends with the line “divider” because I thought that the hat was tall enough. This is a hat I’ll be returning to again. 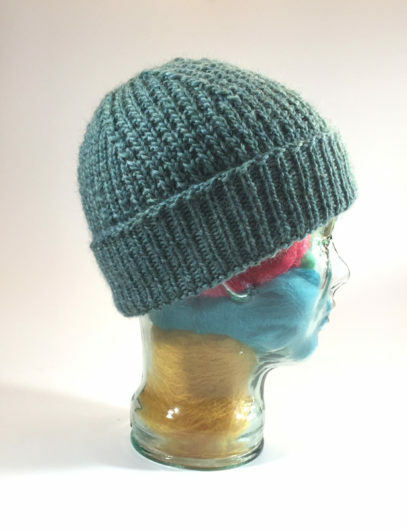 In fact, maybe sooner rather than later because snow always energizes my hat knitting. 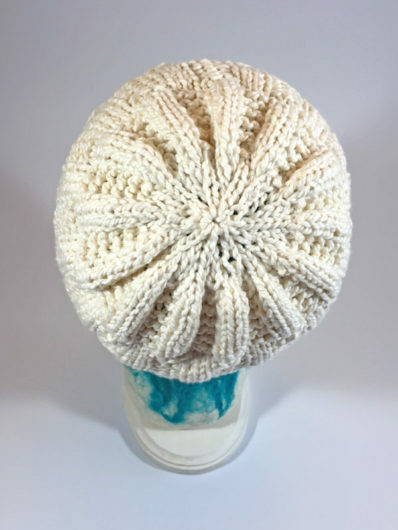 This next hat is an Aimee Alexander (Polka Dot Knits) design: Boon Island. I knit mine in Berroco’s Ultra Wool, another excellent newer superwash worsted. The “cracked rib” a/k/a “broken rib” stitch is an easy two-round pattern that makes for excellent social knitting. I couldn’t quite get the gauge of 22 stitches and 34 rows to 4 inches in Ultra Wool. My gauge on size 7 US needles was 23 stitches to 4 inches. 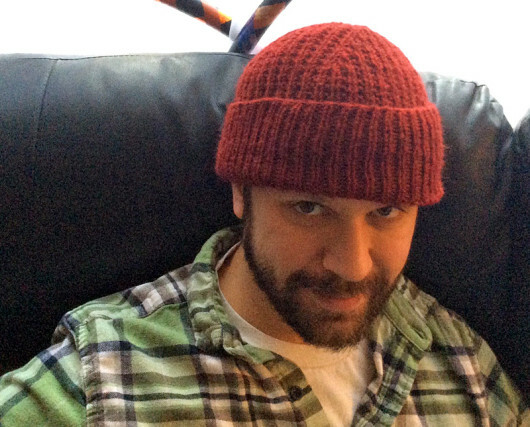 But the hat is very stretchy and gives a knitter a Get-Out-of-Jail Free Card on minor gauge problems. 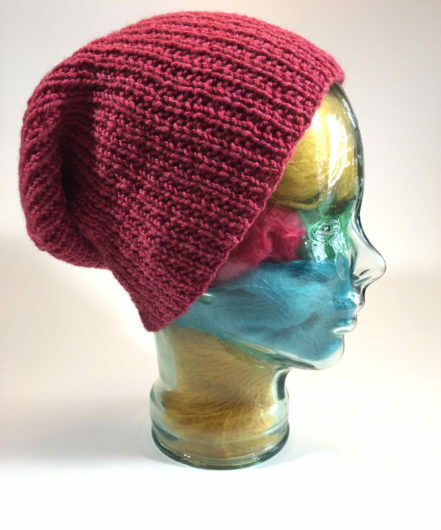 The hat can be worn slouchy. Or it can be worn cuffed. Either way, every head, all sizes, will find that Boon Island suits. 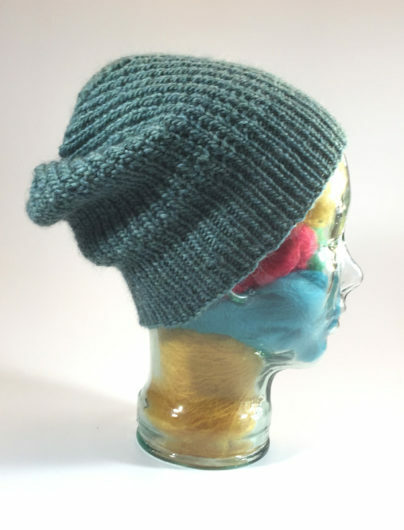 And the hat really flies off your needles because every other round of broken rib is a knit round. Boon Island is a close cousin to Jennifer Adams’s Graham, a Ravelry freebie. 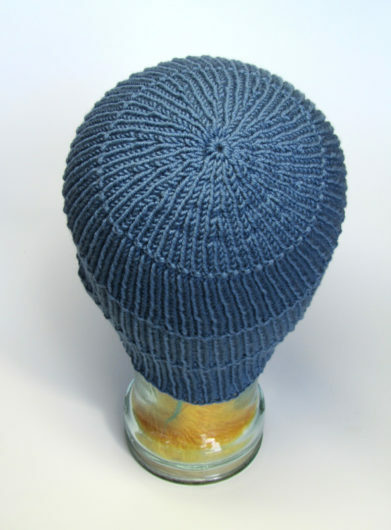 Adams’s hat uses a traditional ribbing at the outset. This time I knit my Graham in Berroco Peruvia. Peruvia is considered an Aran weight, but the hat worked out just fine. Graham’s pattern calls for Berroco Ultra Alpaca, which is labeled a worsted but knits up (for me) a tad beefier. The crown treatment on the two hats is different, with Boon Island’s creating a more pronounced “x” of decreases as compared to Graham’s more traditional simple shaping. Both Boon Island and Graham are completely reversible. That’s a nice touch in any simple hat because the knit-clueless among us often seem to wear their hats inside out. With these hats, it won’t matter. A number of knitters, myself included, have altered the Graham crown decreases thinking to eliminate any hint of a pointy top. For me, at round 19 I knit 2 together across the round. I worked K1, P1 across round 20. And for round 21, I k1, k2tog across the round. That left 14 stitches remaining to close the top. Here’s the Graham I knit a few years ago, in Berroco Ultra Alpaca. I didn’t modify the crown and the off-head pointy crown totally disappears. My son prefers to wear his Graham cuffed. Personally, I think “my” model rivals Locatelli’s. But I’m probably biased. This next cracked/broken rib hat is Virginia Myers’s The Only Hat Your Teen Wants. I knit mine in the lovely-to-look-at Brillo Pad competitor yarn, Caron Cupcakes. 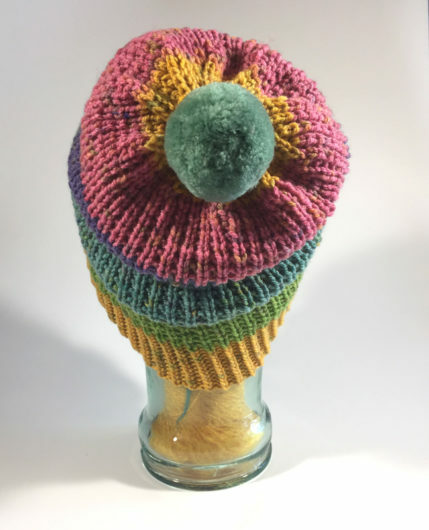 It’s a DK weight acrylic caked up in a really attractive run of five colors, complete with a pompom. The look of this hat? Very, very nice in this yarn. 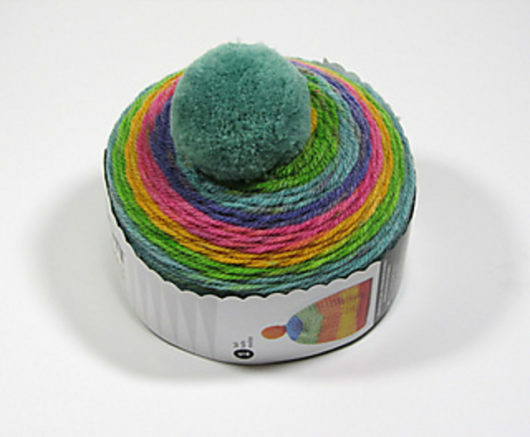 The price point of this yarn? Excellent. The pattern? A really good one. It’s a DK take on mistake rib, with a twisted rib cuff. The feel of this yarn? Really, really rough with that unpleasant squeak-on-the-needles quality. That being said, after I washed the hat and put it in the dryer (before attaching the pompom), it softened nicely. There was no way this hat would do its slouch thing without a washing. First off the needles, the hat stood on its own. If Cupcakes tempts, this pattern really shows off the yarn. 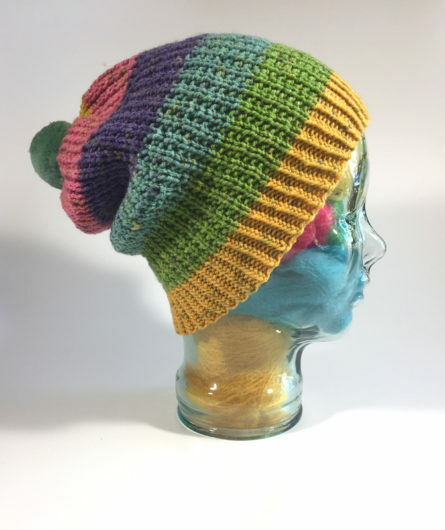 Haxann Evers’s Garter Rib Bliss is one last entry in the ribbed hat category. It’s another Ravelry freebie. I knit mine in Blue Sky Fibers Handspun Organic Cotton, a beefy worsted weight. 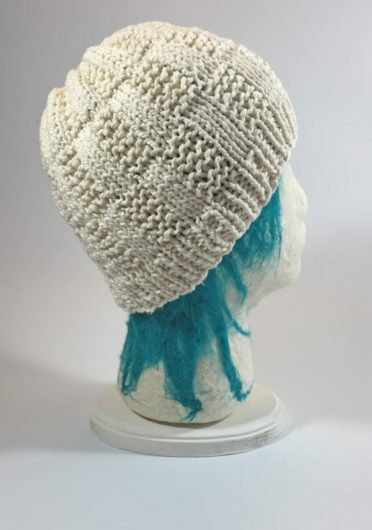 Check the other Ravelry projects for this hat to see its very different look knitted in soft acrylic or non-cotton natural yarn. The non-cottons bunch the yarn so that the ribbing looks more, well, ribbing-like. But I like the looks of mine. I was prepared to not like the very abrupt K2 together all across the round crown decreases in this pattern. Instead, I’ve decided that I like the effect. Very nice ribbiness. Often keeping it simple works really well.